Ivanovo Rock Churches is a unique monastery complex, which has no analogue in Bulgaria. A simple traditional cloister, incorporate several churches and halls for the monks, while with the Ivanovo Rock Churches you can see a kind of network of small rock churches, chapels and cells, which are carved into the rocks of the picturesque canyon. Ivanovo Rock Churches are carved at 32 m height above the water. The unique and beautiful complex of rock churches of Ivanovo is situated 12 kilometers south of the Danube city of Ruse. In this part of northeastern Bulgaria, the rock churches are located next to the village of Ivanovo. There was the bosom of Christianity for centuries. As an important religious monument of Bulgarian culture Ivanovo Rock Churches are included in the list of 100 national ttourist sites. In 1979 UNESCO included the Ivanoco rock churches in its list of monuments of world cultural and natural heritage along with nine other sites in Bulgaria. This monastery near Ivanovo is the most popular rock group of monasteries in the region, mostly because its beautiful and has well-preserved frescoes. The zenith of the Ivanovo Rock Churches reached the landmark in 10th and 14th century, when medieval stone churches, monasteries, and individual hermits’ cells became part of the famous Bulgarian spiritual center. In the 13th century hermits dug near the natural caves of Rousse and even further around 40 churches and chapels, monasteries and around 300 cells in limestone on both sides of river. 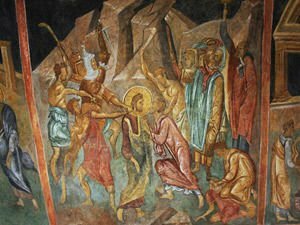 Some of the caves have been dapted and some are still in their original, natural form, most of the beautiful and interesting paintings, which today can be seen on the walls of the Ivanovo Rock Churches were painted in the 14th century. These perfectly preserved specimens of mural paintings are evidence of the exceptional talent of the artists of the Turnovo School. The churches and all premises of Ivanovo are united in the great rock monastery "St. Archangel Michael". It was founded over 20 years of 13th century monk Joachim whom was later elected the first Patriarch of Turnovo. "Holy Mother" is the most famous of the churches and you can see the great portrait preserved of King Ivan Alexander. In the Ivanovo Rock Churches is the painted portrait of the first royal wife - Theodora, who later became a nun. During the Second Bulgarian Kingdom which was founded by brothers Asen and Petar in 1185, Ivanovo Rock Churches enjoyed the favor with the rulers. Heirs of the brothers who ruled until 1396 often maked donations to the monastery thus why their faces are depicted on the walls of the monastery.